Ecta tried her best, but this happens almost every time. This reminds me of the first time around, when Skaerva and co journeyed into the library to find the book. Seems even the gentle approach scares grandpa Skaerva. But I forgot to comment this, but congratulations on finishing the arc as well! You’d think that it’d be easier to get someone’s attention without scaring them, but I’ve yet to discover it. So far, I’ve tried standing around a corner and waiting for them to come to me, tapping them on the shoulder, literally standing in front of them until they notice me, and even sitting down next to them. Never works. Oh man, how many small keys per castle? If you had a dungeon that was just a labyrinth that required you to use the same keys a few times over the course of it, so you had to hold on to each key and use each one individually from the inventory to try it on a door, that’d be quite the time sink for Team Villain to prepare for Blank’s arrival. Critique: The dust doesn’t look quite right to me. I think that this is because it simply continues over edges, making it seem to “float”. PS: No character tag for The Second? Yeah, I was going for like… the dust is clumpy and has enough particles in it so that it would get all stuck together and cling like a net. I have seen dust like that before. Bleh. But I fixed it because I didn’t want it to be confusing. The real question is… where’s the character tag for the librarian? Regarding the dust: Aah, fair enough. I’ll confess that it didn’t look that way to me–but then I might just not be familiar with that sort of dust. It might have been clearer if shaded, since that should convey shape and hopefully dispel the impression of the dust-clumps floating. Regarding the tags: Fair enough again! Poor Second…any real reason he’s so jumpy? I feel bad for him. I don’t suppose he’s friends with the moths at all? The ninth panel kills me. It’s perfect. He IS friends with the moths! Although they occasionally chew on books so they can be enemies too. When a ghost spooks a ghost, a vicious spooking cycle may occur. The energy from this eternal exchange of surprise could potentially be used to power a small lightbulb. What’s a better power source, the spooking cycle or Orange Fury? Both are renewable, at any rate. I get the feeling this isn’t too far off from how things were when The Second was still alive. It’s good at least someone else still keeps in touch with him. Some of the ghosts would have known him his entire life after all. The Third spends quite a bit of time with him! He makes sure the Second gets newspapers too, so he can keep up with current events if he wants- although sometimes he doesn’t really comprehend that what he’s reading is supposed to be reality, or that the fiction on the shelves isn’t. honestly i more wonder what could scare a ghost. i mean i guess blank can. he somehow has a ghost swiping sword. meanwhile, i feel magic would work too… which makes me wonder… why is it … wait. if ghosts have the possibility of some sort of death or something… there is reason to fear blank and his sword, BUUUUT, if that is true is not death the thing they wish for most and thus that means that the second and third should thus be able to be released from the curse? also… if the third was all about his place in society… why isn’t he being a miniboss against blank or something? i mean i’m sure they have their reasons, but it still have to wonder. I don’t think we’ve ever shown Blank slashing ghosts. He’s not able to. BUT, he can immobilize them with magic weapons or starch. Ghosts can feel pain/discomfort due to magic attacks, so they have reason to be scared, but they can’t be destroyed or pass on until their respective curse is broken or their unfinished business met (like with Silverskull who was waiting for someone to complete his challenges). In Bladud’s case, his spirit was completely tied to the stone because he had transferred so much of his essence into it that it bound his deceased soul and prevented it from dispersing back into the magical plane. I would say that ghosts also can still get spooked even if it isn’t logical. Like if you’re watching a horror movie, logically you would know that you’re perfectly safe, but if you get absorbed in the action you still might be mentally terrified. Ghosts could still experience fear of mortality as a natural instinct that may never fully go away, even after being dead for decades. The Third knows his time is done and lets his son fight his own battles. He retired as lord before he died and he’s fine with staying out of the way, mostly. You’ve seen how badly things go when he just tries to give the Fourth advice, let alone making an effort to be more involved. Awww, The Second has that “Ah, the days of my youth!” look on his face. Fond memories, I take it? I think he’s just reading a feel-good story, but it might well be reminding him of something, or someone. An update! Now I need to get back in the habit of checking the site regularly again! It looks like Frozio is doing well for himself at the castle. I’m really happy to see him again! Yeah, excepting this past week when we were on a trip, we should be regularly updating again! Oh! You started up the comic again and I missed it! Well, I’m caught up now at least. Looking forward to seeing where this is going! … I know I probably used that incorrectly but O’Chunks has such a funny catchphrase, you’d need an excuse not to use it. 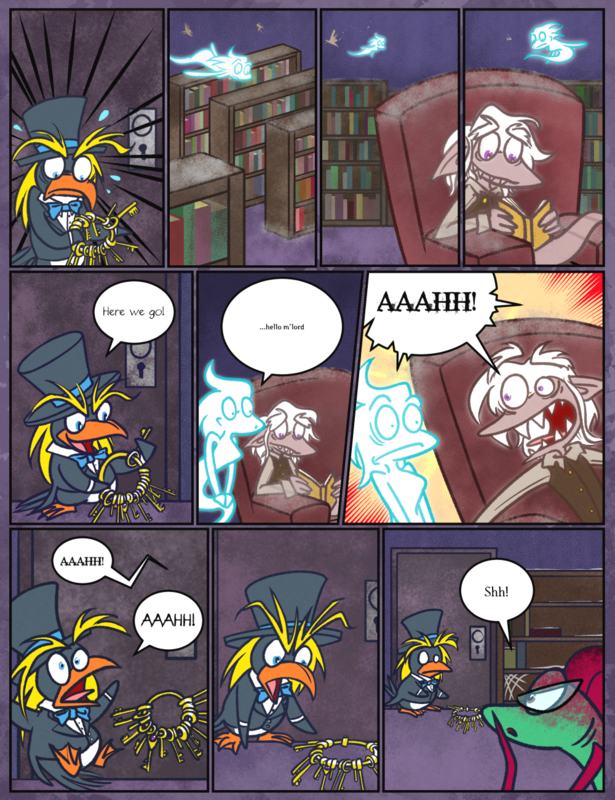 Panel seven looks very reminiscent to the newer Rayman Games, and I love it.